The modern lifestyle introduces stressors of all sorts, including difficult-to-digest foodstuff. The Paleo Elimination Diet simultaneously removes common inflammatory foods while focusing on nutrient-dense, healing foods. This drastically reduces the body’s overall stress load and normalizes the fight-or-flight hormone, cortisol. Once cortisol begins to cycle correctly (peak in the morning for waking, drop off in the evening for sleeping), melatonin function also begins to regulate (rise in the evening, sustain a high level during sleep, and recede in the morning). Paleo staple foods provide crucial building blocks for neurotransmitter production. Neurotransmitters pass signals between nerve cells and are responsible for a wide range of functions including moods (dopamine, serotonin) and sleep (melatonin). Melatonin is synthesized from serotonin, so any food that supports serotonin production or elevation will also support sleep. These include glycine-rich foods (bone broth, gelatin), tryptophan-balanced foods (organ meats, seafood…note, turkey has tryptophan but also contains competing amino acids), and omega-3 rich foods (fatty fish). Proper melatonin levels are key to a good night’s sleep and the Paleo Lifestyle both improves melatonin levels and reduces other factors that interfere with melatonin function. Food sensitivities, nutritional deficiencies (especially B vitamins, omega-3’s and tryptophan), exposure to chemicals in food and the environment, hormonal disruption and even unmanaged stress can all interrupt melatonin production or function. Unfortunately, these are common circumstances for those eating a typical western diet. The Paleo Diet reduces these unintended stressors and encourages other sleep-enhancing behavior (more below). Diet plays a strong role in sound sleep. Surprisingly, the digestive tract acts as a second brain in the body. It is lined with neurons (nerve cells) and plays an important part in neurotransmitter production and absorption. The Paleo Diet soothes the digestive system, heals a leaky gut, balances the gut flora and restores proper function to the gut neurons. These combined factors increase neurotransmitter availability and utilization. In fact, individuals who adopt a Paleo Diet can use sleep quality as a gauge when reintroducing non-Paleo foods: a disruption to sleep often indicates sensitivity to the reintroduced item. As individuals transition to a Paleo Diet, their health improves, often to levels higher than anticipated. Once people physically feel how a traditional diet restores vitality, it is natural to wonder if other ancestral behavior patterns will also enhance health. A Paleo Lifestyle embraces traditional wisdom and encourages individuals to experiment with limiting exposure to artificial lights after dark (use these blue-light blocking glasses), dedicating more time to sleep, reducing exposure to EMFs (electro-magnetic fields), exercising with traditional functional movements, consuming bone broth, avoiding environmental toxins and more. 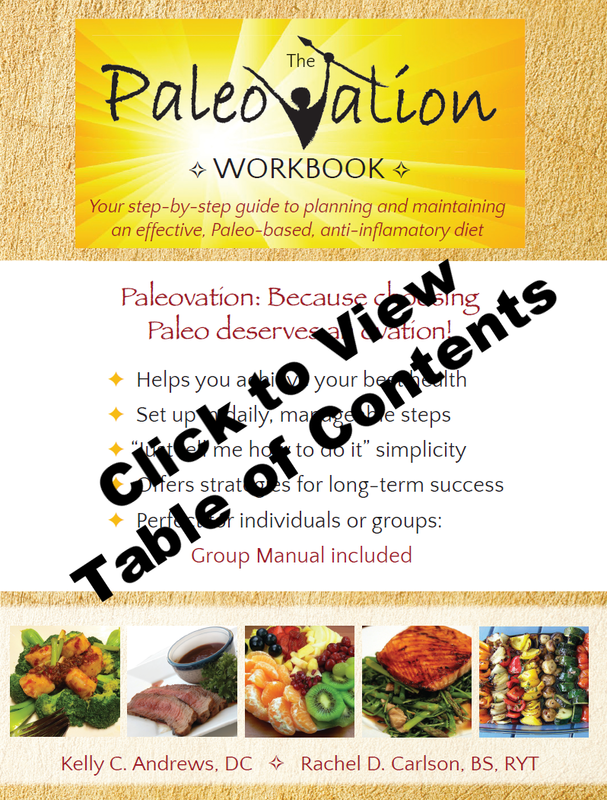 Wide-ranging strategies are discussed in The Paleovation Workbook. The body already has the innate ability to heal – Paleo simply creates the ideal set of circumstances to foster and sustain this natural healing.